After the continuation of last year’s bullish sentiment into January, the month of February showed a much different picture, with drops in major markets and an increase in overall volatility. Major indices corrected significantly in the first week of February and have subsequently regained only some of these losses. The MSCI World Net Total Return USD Index lost -4.1%, but remained in positive territory for the year with a YTD performance of +0.9%. The MSCI Emerging Markets Net Total Return USD Index suffered a similar loss of -4.6% last month. Frontier markets overall fared relatively better, underscoring the low correlation between frontier markets and emerging markets, as well as between frontier markets and developed markets. The MSCI Frontier Markets Asia Net Total Return USD Index lost just -0.8% last month, while the MSCI Frontier Markets Net Total Return USD Index dropped -1.5%. 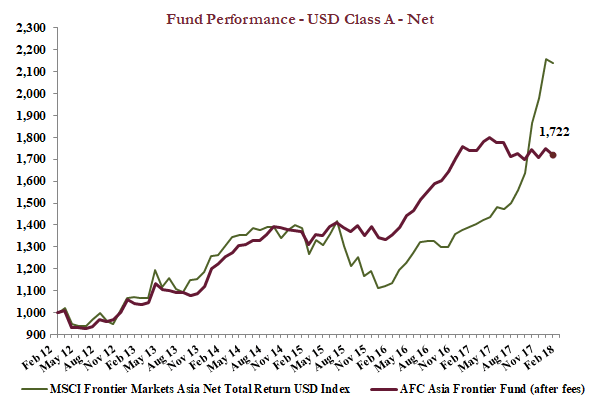 The AFC Asia Frontier Fund returned -1.5% in February, and is now up +72.2% since inception, which corresponds to a healthy annualized return of +9.6% p.a. since inception, reflecting the strategy’s ability to generate consistent long-term returns. 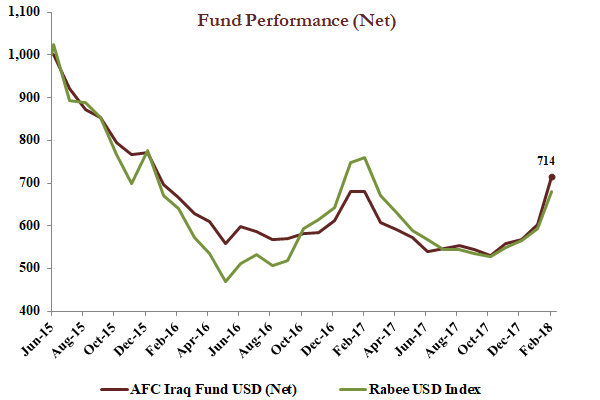 The AFC Iraq Fund returned a whopping +18.4% in February, outperforming the benchmark, the Rabee USD index, which gained +14.5%. Year to date the fund racked up a return of +25.9%, signalling, what we believe, is “a long-awaited recovery” for the Iraq equity market after a decline of -68% from the peak in early 2014 until the bottom in May 2016. The AFC Vietnam Fund rose +0.4% in February, while the VN-Index in USD terms rose +1.0%. The fund is now up +86.9% since inception, representing an impressive annualized return of +16.1% p.a. The AFC Asia Frontier Fund (AAFF) USD A-shares lost -1.5% in February 2018. 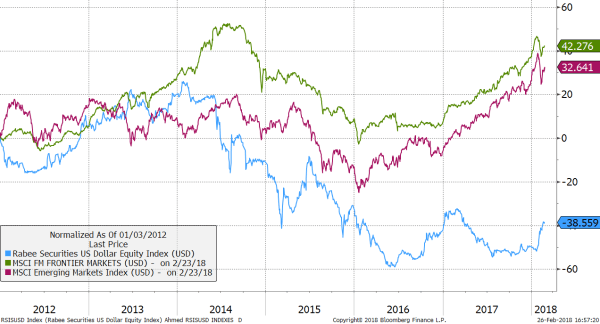 The fund underperformed the MSCI Frontier Markets Asia Net Total Return USD Index (-0.8%), had a similar performance to the MSCI Frontier Markets Net Total Return USD Index (-1.5%), and outperformed the MSCI World Net Total Return USD Index, which was down -4.1%. The performance of the AFC Asia Frontier Fund A-shares since inception on 31st March 2012 now stands at +72.2% versus the MSCI Frontier Markets Asia Net Total Return USD Index, which is up +113.9%, and the MSCI Frontier Markets Net Total Return USD Index (+67.4%) during the same time period. The fund’s annualized performance since inception is +9.6% p.a., while its YTD performance stands at +0.9%. The broad diversification of the fund’s portfolio has resulted in lower risk with an annualised volatility of 8.85%, a Sharpe ratio of 1.05, and a correlation of the fund versus the MSCI World Net Total Return USD Index of 0.33, all based on monthly observations since inception. February was another month where investors got nervous about rising interest rates in developed markets, and global markets faced a steep correction. However, Asian frontier markets, as has been the case in the past, fared better and did not correct as much, with some of our markets bucking the trend, such as Iraq, which witnessed a rally of 12.7% in local currency. Lower foreign investor participation, domestic driven economies, and under researched markets are some of the main reasons why our fund universe saw a lower decline this month compared to global markets, which helped with relative performance compared with global indices. In the first half of the month, amongst the fund’s universe, Vietnam bore the brunt of the correction in global markets with the Ho Chi Minh VN Index declining 4.6% before the start of the Lunar New Year break, but recovering towards the end of the month thanks to the banking sector continuing to rally. Fundamentals of the economy remain strong, however, with valuations of mid and small cap companies continuing to offer more value compared to large cap stocks, which have experienced a run up in valuations over the past year. For the fund’s other larger markets, this was a month of political developments. Pakistan continued to see political noise in the run up to national elections this summer as the Supreme Court disqualified former Prime Minister Nawaz Sharif from heading his party, the PML (N). Both the decision by the Supreme Court, as well as the follow-up decision by the PML (N) electing Shehbaz Sharif, the younger brother of Nawaz Sharif, as the head of the PML (N), did not come as a surprise. Nevertheless, volatile global markets and political uncertainty, due to the Supreme Court decision, impacted market sentiment. This decision did not affect the upcoming Senate elections which went ahead as scheduled on 3rd March 2018 with PML (N) gaining as expected the highest number of seats. This should give more confidence to the market with respect to having timely national elections in August 2018. The Bangladeshi market continued to remain weak due to some amount of political uncertainty as the leader of the opposition, Khaleda Zia, was sentenced to five years in prison which could lead to some amount of political uncertainty in the run up to the national elections at the end of 2018. The fund’s Bangladeshi holdings however have done well this year, as it does not hold any banks whose stock prices have corrected the most this year on the back of worries regarding declining net interest margins and a new banking directive. The fund’s Bangladeshi holdings have so far had a positive return thanks to exposure to consumer staple, pharmaceutical and telecom stocks. The Sri Lankan coalition government witnessed a political setback as the former President Mahinda Rajapaksa’s party won a majority of the votes in the local council elections. 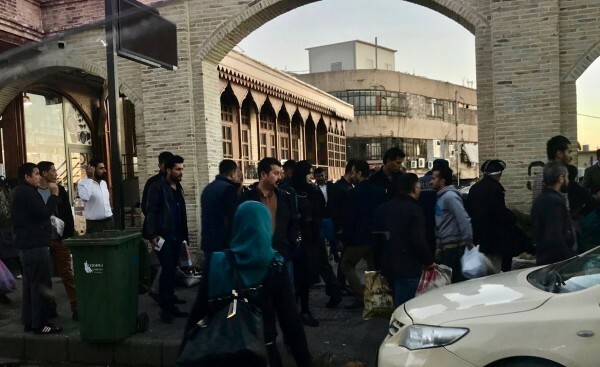 Therefore, it would not be surprising if the current government does not implement all of its tax related measures announced in the recent budget, as well as loosen the fiscal strings in order to cushion consumer incomes and recover some lost ground prior to the parliamentary elections at the end of 2019. Mongolia is continuing its slow but steady recovery as most listed companies have reported full year earnings and whose results indicate a modest improvement in the economy during 2017. 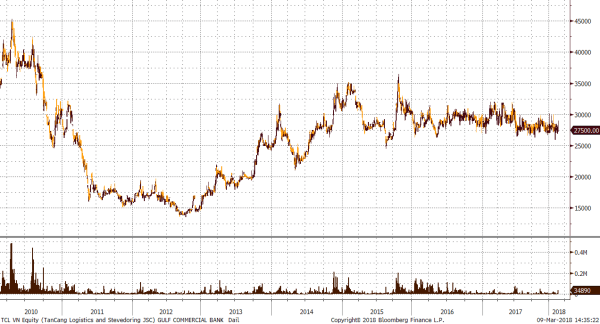 The past year has seen over a 70% rally in the index as large cap consumer plays and exporters continue to perform. The one wild card for the economy is when the constraints surrounding the Gants Mod border crossing will be eased as there remain issues with coal bearing trucks being able to move through as seamlessly as before last summer. It has been reported in the media that 1,000 trucks per day are now allowed to cross the border into China, though it seems the real number is closer to 250. In order for Mongolia’s economic recovery to continue, resolving its export bottleneck is paramount. The visit of Prime Minister, U. Khurelsukh to Beijing from 10th to 13th April will be telling on this matter. Further, on 6th February the IMF announced it had reached a staff-level agreement with the Mongolian government on the 3rd review of the Extended Fund Facility program. 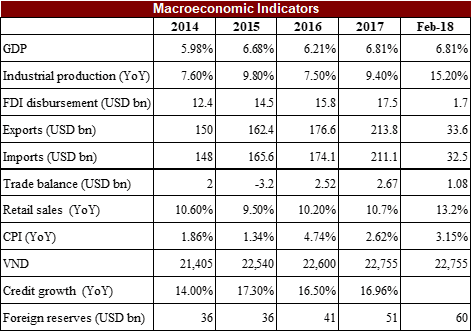 The IMF also revised its projections for GDP, with 2018 and 2019 projections of 5% and 6.3%, respectively. The best performing indexes in the AAFF universe in February were Iraq (+12.7%), Cambodia (+4.1%), and Sri Lanka (+1.2%). The poorest performing markets were Bangladesh (-3.9%) and Mongolia (-3.2%). The top-performing portfolio stocks this month were a Mongolian oil exploration company (+45.6%), a Vietnamese telecom equipment company (+40.7%), a Mongolian consumer discretionary company (+22.2%), a Mongolian internet company (+21.2%), and a Mongolian duty-free chain store (+19.8%). The fund added to existing positions in Mongolia and Vietnam while partially reducing the fund’s holding in three companies in Vietnam and exiting a Pakistani leasing company. As of 28th February 2018, the portfolio was invested in 114 companies, 1 fund, and held 2.2% in cash. The two biggest stock positions were a pharmaceutical company in Bangladesh (8.5%) and a pump manufacturer from Vietnam (3.3%). The countries with the largest asset allocation include Vietnam (27.0%), Pakistan (19.9%), and Bangladesh (18.3%). The sectors with the largest allocations of assets are consumer goods (29.3%) and industrials (17.0%). The estimated weighted average trailing portfolio P/E ratio (only companies with profit) was 13.35x, the estimated weighted average P/B ratio was 2.70x, and the estimated portfolio dividend yield was 3.61%. The AFC Iraq Fund Class D shares returned +18.4% in February with a NAV of USD 714.20 which is an outperformance versus its benchmark, the RSISUSD index, which gained +14.5%. The positive momentum which started during the second half of January continued unabated throughout February with both prices and turnover increasing meaningfully. The average daily turnover reached the same levels last seen in early 2016 that were marked then by two significant events: the first being the sale of HSBC’s 8.8% holding in Dar Es Salaam Bank, while the second was the liquidation of a sizeable foreign Iraq fund for a total amount of around USD 20m. The two events combined with the then collapsing oil price had a devastating impact on the market in which heavy selling sent the daily turnover higher and prices lower (see chart below). 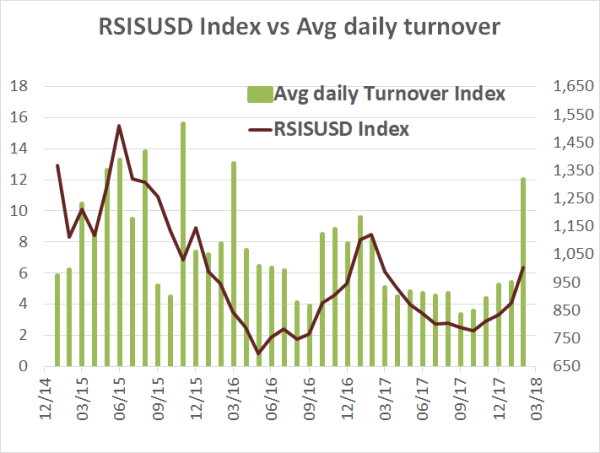 Foreign investors, in an almost mirror image reversal, have been net buyers to a much larger degree than in prior upturns since the May 2016 bottom. However, the increase in foreign buying as a percentage of total buying has been less than that of the increase in absolute foreign buying, indicating that while foreign buying might have been a catalyst it was local buying that drove total buying. 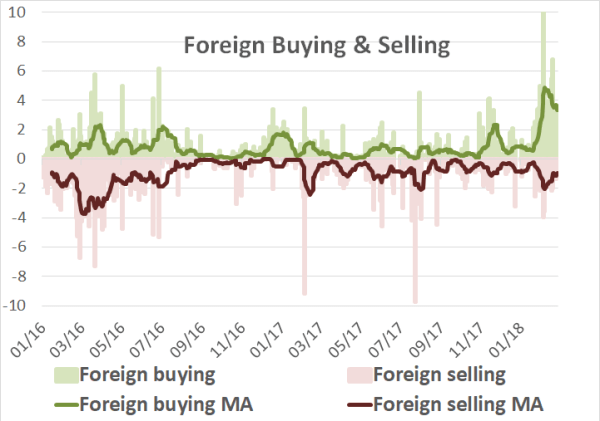 Foreign selling, both in absolute levels and as a percentage of total selling, has been in-line with those of the last few months. While the chart below shows these and the mirror image symmetry of the current market vs. that which prevailed in early 2016, yet it suggests that the current phase is in its early stages and that an increase in liquidity would need to be maintained for the rally to be sustained. Early but narrow market leadership by high-quality names such as mobile operator Asiacell (TASC) and Pepsi bottler Baghdad Soft Drinks (IBSD) that started the recovery in December has expanded in February to include high quality names in the banking sector. The foreign buying interest that was focused then in these two names has also expanded to include high quality names in the banking sector. Fundamentals continued to fuel the buying interest as discussed in January’s newsletter. In the case of the banks, the fundamental change has been a bottoming of the negative developments that prevailed over the last three years, i.e. declining/negative deposit growth, declining/negative loan growth and increasing NPL’s (non-performing loans). Their outlook is brightening as the expansionary effects from the reversal of the escalating costs of conflict and collapsing oil prices that crushed the economy in 2014 provides the banks room to recover further and grow. The banks’ own confidence in their outlook, discussed in our July newsletter, when high-quality banks declared dividend yields of up to 11%, while valuations were attractive with these banks’ market capitalizations trading at under 20% of their assets, which themselves were over 70% in cash and cash-equivalents. The fundamental reasons for market leadership is the main characteristic that differentiates the current rally from that of the October 2016-February 2017 rally, in which the then leadership was concentrated in names that were extremely leveraged to the economic recovery post-conflict. Then, sharp rallies in lower priced and lower quality but high beta stocks drove the market’s gain as reported in October 2016. It was argued then that, “this should dissipate as high-quality stocks resume market leadership as part of the market bottoming and eventual recovery process”. While this seems to be the case now, it is still very early in the recovery process and remains to be seen if this recovery will extend and broaden out over the next few months. The increased liquidity in the form of both local and foreign inflows needs to be maintained for the market’s recovery to be sustainable. Given the time lag involved, this will probably unfold over the next few months and the recovery will likely be in fits and starts with plenty of zig-zags along the way. This underscores the opportunity to acquire attractive assets that have yet to discount a sustainable economic recovery. The outcome of the Kuwait conference for the reconstruction of Iraq, in the form of loans/investments for the initial stages of the reconstruction drive, will likely add fuel to the expansionary effects of the reversal of the escalating costs of conflict and collapsing oil prices that crushed the economy in 2014. 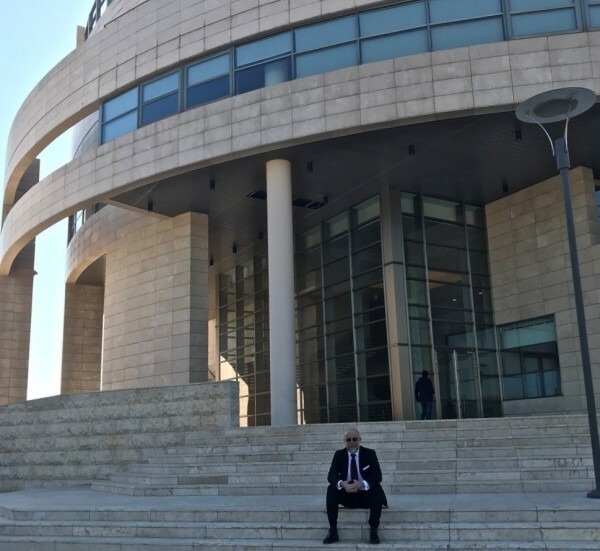 The coverage of the conference was confusing at best and which the recent article by AFC’s Ahmed Tabaqchali, “It’s not the donations, stupid”, discusses and puts into a clearer perspective. As of 28th February 2018, the AFC Iraq Fund was invested in 14 names and held 3.5% in cash. The fund invests in both local and foreign listed companies that have the majority of their business activities in Iraq. The markets with the largest asset allocation were Iraq (97.5%), Norway (2.0%), and the UK (0.5%). The sectors with the largest allocation of assets were financials (47.1%) and consumer staples (25.1%). The estimated trailing median portfolio P/E ratio was 10.01x, the estimated trailing weighted average P/B ratio was 0.90x, and the estimated portfolio dividend yield was 4.70%. 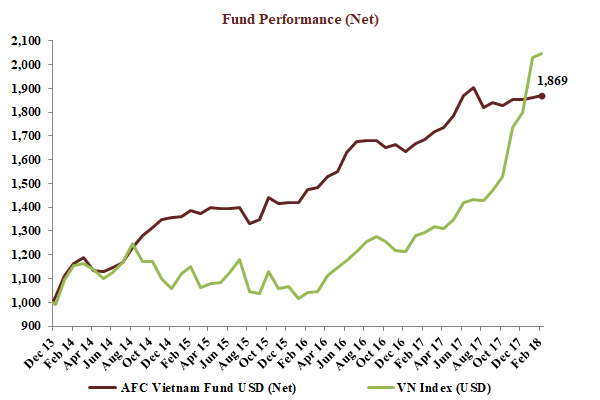 The AFC Vietnam Fund returned +0.4% in January with a NAV of USD 1,869.46 bringing the return since inception to +86.9%. This represents an annualised return of +16.1% p.a. The February performance of the Ho Chi Minh City VN Index in USD was +0.8%, while the Hanoi VH Index gained +1.5% (in USD terms). The broad diversification of the fund’s portfolio resulted in a low annualized volatility of 8.78%, a high Sharpe ratio of 1.78 and a low correlation of the fund versus the MSCI World Index USD of 0.26, all based on monthly observations. February was a very good example of why investors should not consider knee-jerk reactions when having a long-term investment view. Blue chips recovered all of their heavy losses from the first part of the month and the indices in HCMC and Hanoi ended the short Lunar New Year month with gains of 1.0% and 1.7% in local currency terms (the Dong ended approximately 0.25% weaker versus the USD), while small- and mid-caps recorded their biggest losses since October. As usual the AFC Vietnam Fund was less affected by those high volatility index movements and also recovered from earlier losses, closing the month with a gain of +0.4%. After the long Lunar New Year holiday the Vietnamese stock market bounced back along with others around the world. It seems that the once low correlation between Vietnam and leading markets in the US and Europe is history, at least for now. Financials and other index heavyweights are bought and sold by both index tracking funds and local investors at the same time. The rising risks for investors, described by elevated volatility over the past few weeks, is concentrated in the index stocks, while most mid and small caps remain neglected by investors as weak market breadth and low volume prevails. The AFC Vietnam Fund has always been much more stable in terms of price movements than the general market and this was especially so in February as it became obvious how short-term movements from global investors can affect so-called “safe” blue chip stocks in Vietnam. In the two day sell-off where the market fell 8.5%, many investors were not able to sell when prices were limit down (7% for HCMC Index, 10% for Hanoi Index). On a mid to longer term view, the strategy of the AFC Vietnam Fund aims to reduce the risks which we are currently seeing in Vietnamese blue chips, namely increased volatility and high valuations. We are therefore investing in attractively valued stocks with low volatility. This has resulted in a high Sharpe ratio of around 1.8, despite the spike of the index in recent months. (The Sharpe ratio is a way to examine the performance of an investment by compensating for its risk. The ratio measures the excess return over the risk-free rate, divided by its volatility). Throughout history investors have always looked for the highest possible gain in the shortest period of time. If that would not be the case, then there would never be any bubbles or overvaluation in the marketplace. Investor’s memories tend to be short lived. Not a very long time ago, people were afraid of holding cash in their bank accounts, not to mention investing in stocks or new financial instruments they hardly understood. Now, many people – once again - are back and looking for ideas that will generate 10% a month or more. We have been a bit anxious about the developments over the past 6-12 months as the ultra-low interest rate environment around the world was a drug for investors over the past few years and is now at risk of being taken away by central bankers. 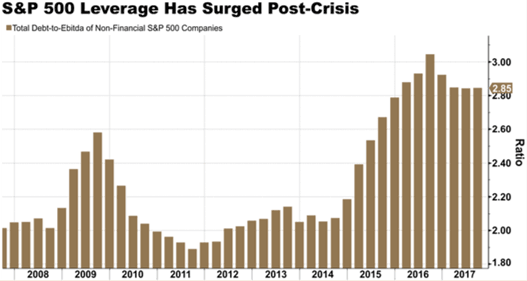 Maybe even worse, it seems that not only investors have a bad memory about recent financial history, but also corporate managers, as they were very eager to add risk in return for higher profits in the short term by raising debt levels over the past three years to levels not seen since the outbreak of the global financial crisis less than 10 years ago. While we do not make any forecasts about the stock markets in the USA or in Vietnam, we certainly feel safe with a portfolio valuation of around 10x earnings and no net debt at all in many of our invested companies, compared to the more liquid index heavyweights, which are trading at 20-40x earnings with mostly higher debt levels. One good example of how investors are neglecting small caps is a local logistics company we own, where its stock market turnover has shrunk, along with many other stocks, over the past 18 months during a period where prices and turnover of only a few stocks rose strongly. While many investors interpret liquidity as safety, we think that at some point it is purely speculation from short-term investors (aka “investors with weak hands”). Located close to the industrial hub of Ho Chi Minh City, the company’s stock is trading below book value and with a P/E of only 6x,with no net debt on its balance sheet. While we are waiting for a continuation of a rerating of the stock we are enjoying a safe dividend yield of more than 5%. Given the fact that it is almost impossible to accurately forecast stock prices in a fast-growing economy such as Vietnam, investors would be well advised to simply sit back and forget about short term swings, while focusing on the macroeconomic picture. Actions of the Vietnamese government on how to secure long term economic growth are, in our eyes, much more important. In the last ten years the USA has always been the largest export market for Vietnam with around 20% of total exports. In 2017 exports to the USA accounted for USD 41.6 billion, followed by China with USD 35.5 billion. While export growth to the USA has been stable over the last decade, exports to China started to accelerate in 2017, narrowing the gap between the two countries. In 2017 exports to China grew by 61.4%, more than double the growth of the previous 9 years. In January of this year China became the largest export market for Vietnam with exports of USD 3.7 billion (doubling from 2017) compared to USD 3.6 billion to the USA. Accelerating exports to China were mainly driven by mobile phone sales, which skyrocketed 9x to USD 7.2 billion in 2017 compared to USD 0.8 billion in 2016, a trend expected to continue. The proximity of Vietnam to China, a market of over 1.3 billion people, is a big advantage. The rapidly growing consumer market in China will most likely drive continued export growth of Vietnamese products to China over the next few decades. South Korea's GS25 together with Son Kim Group, a Vietnamese retailer, launched its first convenient store in Ho Chi Minh City in January 2018. The two companies are keen to invest in one of the fastest-growing retail markets in the Southeast Asian region and expect to open more than 2,000 outlets across Vietnam within a decade. Vietnam is one of the most attractive retail markets in the world with most international retailers already expanding rapidly, such as 7-Eleven, Family Mart, Ministop, and Circle K. According to A.T. Kearney, Vietnam ranks among the top six most-attractive retail markets globally. However, local retailers still comprise the majority of the market with the two big local players being Vinmart+ (804 stores) and Bachhoaxanh (323 stores). FDI disbursement was USD 1.7 billion, increasing by 9.7% compared to the same period last year. Exports increased by 22.9% and imports by 15.3% to USD 33.6 billion and USD 32.5 billion, respectively. Foreign reserves reached a record high of almost USD 60 billion, according to the ADB. At the end of February 2018, the fund’s largest positions were: Agriculture Bank Insurance JSC (3.7%) – an insurance company, VNDirect Securities Corp (2.6%) – an online brokerage firm, Sam Cuong Material Electrical and Telecom Corp (2.4%) – a manufacturer of electrical and telecom equipment, Danang Housing Investment Development JSC (2.2%) – a real estate company, and Global Electrical Technology Corporation (2.1%) – an electrical equipment company. The portfolio was invested in 73 names and held 4.2% in cash. The sectors with the largest allocation of assets were consumer goods (34.5%) and industrials (28.8%). The fund’s estimated weighted average trailing P/E ratio was 10.15x, the estimated weighted average P/B ratio was 1.69x and the estimated portfolio dividend yield was 6.28%. In line with our process of being on the ground in the countries we invest in, AFC Iraq Fund CIO Ahmed Tabaqchali travelled to Iraq recently for an investment conference. All photos are by Asia Frontier Capital, except where noted otherwise. As discussed in last month’s travel report, this trip to Iraq had several purposes, namely to take part in a Banking conference, meet young Iraqi entrepreneurs, visit companies, and pay a visit to the Iraq Stock Exchange. I also planned to visit the Institute of Regional and International Studies (IRIS) and its parent, the American University of Iraq-Sulaimani (AUIS) in Iraq’s Kurdistan to follow up with future direct research projects on Iraq’s economy post ISIS, and to visit one of Kirkuk’s oil fields. Last month’s travel report was focused on Baghdad, while this month’s report is focused on Kurdistan. 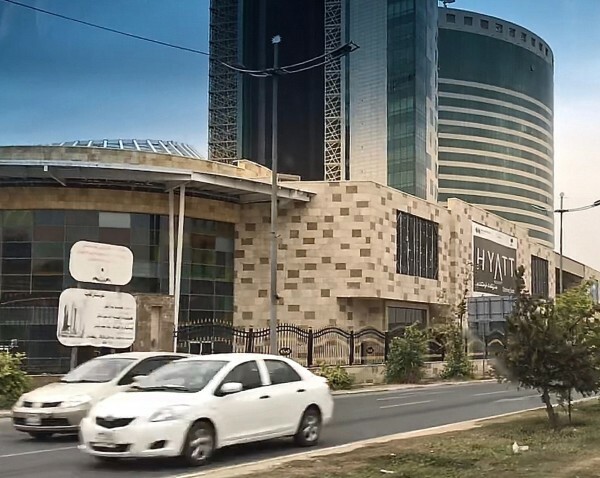 The first part of the Kurdistan trip was to the city of Sulaimani, or Al-Sulaymaniyah or simply Sulaymaniyah in the Arabic adaptation of the original Kurdish name Slemani. Similar to the way that Baghdad was built and founded, Sulaimani was founded by Prince Ibrahim Pasha Baban to be the capital of the Baban Emirate in 1784, and was named after his father, Sulaiman Pasha. The city is a mere child among Iraqi cities and in particular to Erbil, the capital of the KRI, which is much older than Sulaimani and is home to one of the world’s oldest citadels. The similarity to Baghdad extends to its cultural appeal as a capital city, attracting philosophers, poets and writers, which it has maintained throughout the decades. It continues this tradition as an open, liberal and tolerant city- loved by expatriates who affectionately nicknamed it Suli. The city exemplifies the Kurd’s tolerance and open mindedness, especially with regards to gender equality as it is manifested in the independence and treatment of women, a promising model for the rest of Kurdistan and Iraq. The city is the cultural capital of the KRI, and the heart of the Sorani Kurdish culture. Sorani is one of the two main varieties of Kurdish dialects, the other being Kurmanji whose centre is Erbil. Until recently, the dialects were somewhat mutually unintelligible, but this changed with the prosperity that the region attained as the advent of satellite TV has bridged the gap between dialects, much in the same way that Egyptian movies had on the Arab world from the 50’s and more recently satellite TV. The central role that culture plays makes it an ideal educational city, as it is home to two public universities and five private universities, including the focus of my visit “The American University of Iraq, Sulaimani” (AUIS) and its research centre “The Institute of Regional and International Studies” (IRIS) of which I am a non-resident fellow. 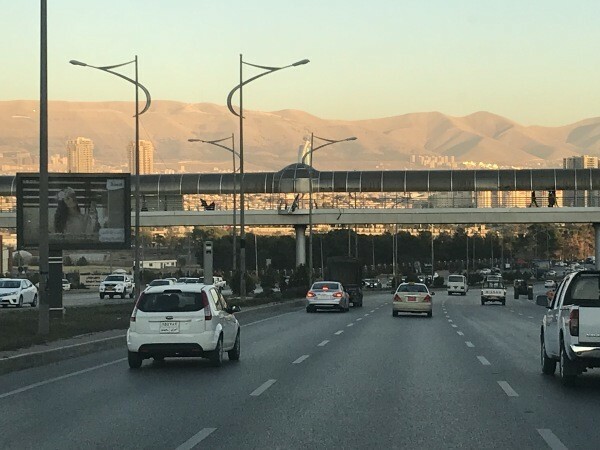 AUIS celebrated its 10-year anniversary in 2017 as a non-for-profit public institution, which coincidently was the year that I became familiar with the remarkable research that the IRIS research team was conducting, and in particular the work on the disputed territories and on “post-ISIS Iraq”. The purpose of my visit was to get to know the AUIS & IRIS teams better and to start the process for conducting further on the ground research of Iraq’s economy post-ISIS as a follow up to my first research publication for IRIS “Iraq's Economy after ISIS: An Investor's Perspective”. My other research interests are the economic roots of extremism and the economic aspects of the KRI within a federal Iraq. The first was a report that looked at the economic viability of an independent Kurdistan “Statehood in the Kurdistan Region of Iraq through an economic Lens”, while the second is a follow-up piece on the economic benefits of the KRI within a federal Iraq, which I will start working on in March. The one-hour flight from Baghdad to Sulaimani International airport landed late at night. The late-night tour of the city was brief, yet it provided a wonderful sense of the peace and tranquillity that Kurdistan enjoyed in the last 13 years in spite of all the violence and turmoil that Iraq went through during that period. In fact, the drive through the city felt no different than any other city that I have been through over the years, and in particular it showcases developments that took place in the region. 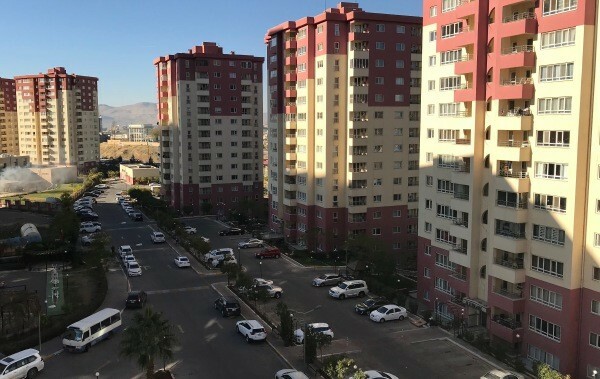 The final destination, the university’s apartment buildings within the Pak City development, is a perfect example of this. The university is located on a hill overlooking the city which provides for some stunning views. I was given a tour of its impressive campus, stretching over 400 acres and consisting of three academic buildings with all the features of modern universities worldwide, in addition to the residence halls which are a boon for the students that come from the rest of the country. 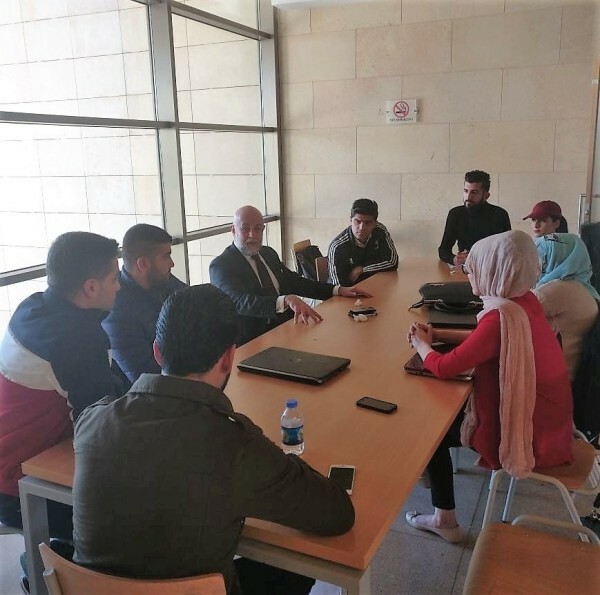 Following that, the day was filled with meetings with the IRIS and AUIS staff and culminated in a rewarding dialogue session with a group of students who came from across Iraq and typified the different ethnic, socio-political, and economic backgrounds of its students. 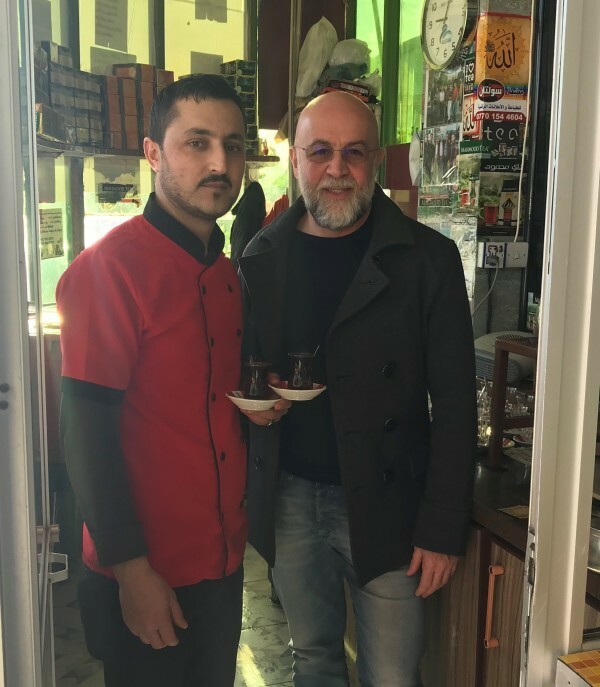 The short time that I had did not allow for a proper visit of the city; however, I still managed a visit to the famous bustling Mawlawi Street filled with all kinds of shops, restaurants, and cafes. The best way to appreciate the street and the life it offers is to spend a day on a weekend sampling all of its wares which is something that I am planning to do in my forthcoming 2-week trip to the city in March. The road to Erbil is about a two and half hours’ drive and I was keen to see the weird and wonderful gas stations of the region so vividly covered in this 2017 article from Wired magazine. 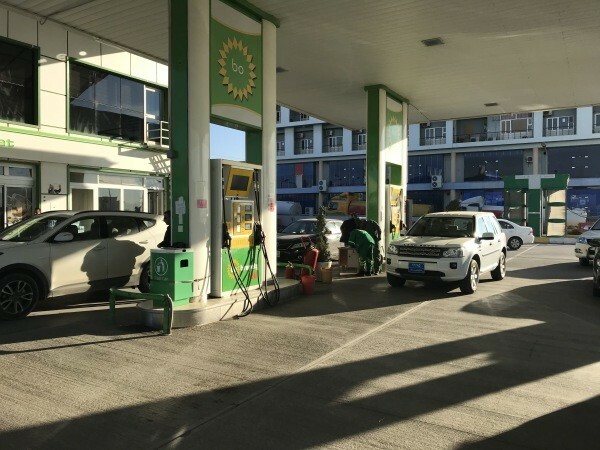 I was not disappointed when we filed up the car from “BO” Service station, a “BP” knock off, nor when we passed by “Shall” a similar knock off of “Shell”. The impressive wide highway soon narrows into a single lane road until arrival at Erbil at which time the wide highway returns. Almost halfway is the resort of Dukan on a lake by the same name created by the construction of the Dukan Dam in 1959, which is one of the many beautiful features of the region. 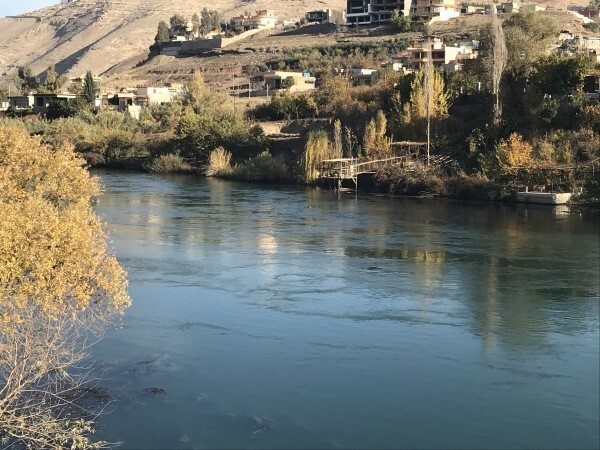 But we did not have time for a visit, settling instead for an Istikan of tea at a pit stop by the Little Zab river that feeds the lake and a tributary of the Tigris river. Istikan, in the Iraqi dialect, is a tiny glass cup used in Iraq and the region to drink tea, where the word is derived from East-Tea-Can which were the small cups used to drink tea brought following the occupation of Iraq by Britain from its then base in India. 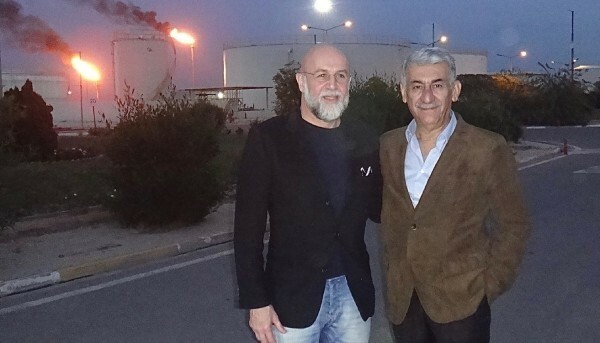 The purpose of the Erbil trip was to meet my old school friend from over fifty years ago and to visit the oil facilities of the KAR Group with him. We shared a love for photography as members of the amateur photography society at high school in Baghdad- Baghdad College which was founded by Jesuit fathers from Boston in 1932. Arguably the college and Egypt’s Victoria College are considered as the best schools in the region. The school’s oversized role in Iraq is often compared to that of the UK’s Eaton College as covered by this fascinating NYT story in 2005. Erbil, just like Sulaimani, can be spelled in many different ways including Arbil or Irbil, while its Kurdish name is Hawler. The city claims that it is the one of the oldest continuously inhabited areas in the world dating back to 5,000 BC. While this is subject to debate, its antiquity is not in doubt as it was first mentioned as Urbilum over 4,000 years ago by one of the Sumerian kings of the city state of Ur, and was later known as Urbilim, Arbela and Arba-ilu in Assyrian annals. The modern city of Erbil has been through a massive transformation in the last 14 years, taking it from a conservative provincial town to a super modern city, a transformation that is often compared to that of Dubai. The city has aspired to be a new Dubai, and a drive through its wide boulevards passing through shopping malls, high rise towers, five-star hotels, and luxury housing developments is a testament to it indeed being a mini-Dubai. However, just as the financial crisis of 2007-2008 ended the Dubai boom in 2009, Erbil’s boom ended with the triple whammy of the budget crisis due to ongoing conflict with the Federal Government of Iraq, the ISIS invasion and the collapse in oil prices in 2014. The city, much quieter than in the peak in 2013, is still beautiful, and its new landmarks wait patiently for a similar recovery that Dubai saw following the financial support of neighbouring Abu Dhabi. In the case of Erbil, this should come after the region’s government, the Kurdistan Regional Government (KRG), negotiates its differences with the Federal Government of Iraq. However, this is a few months away as the country waits for the upcoming parliamentary elections in May and the weeks of suspension afterwards as a new federal government will have been formed. I didn’t have much time to tour the city or take many photographs as my friend was waiting to take me on a tour of the legendary oil fields of Kirkuk. 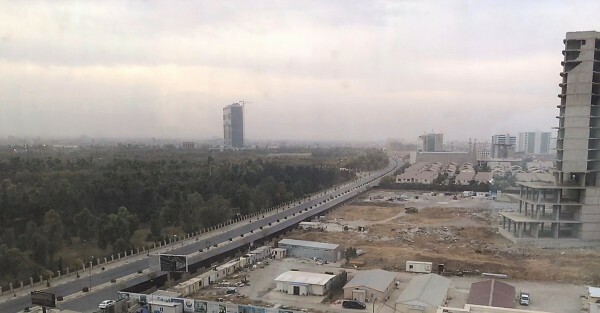 View from the 22nd floor of Diavn Hotel, Erbil overlooking Sami Abdul-Rahman Park. The 40km drive to the Erbil Refinery was not enough to catch up on over 40 years since we last met, nevertheless we managed to cram quite a lot over the next hours and the evening as we toured the refinery, the oil fields, and ended with a feast at his home. 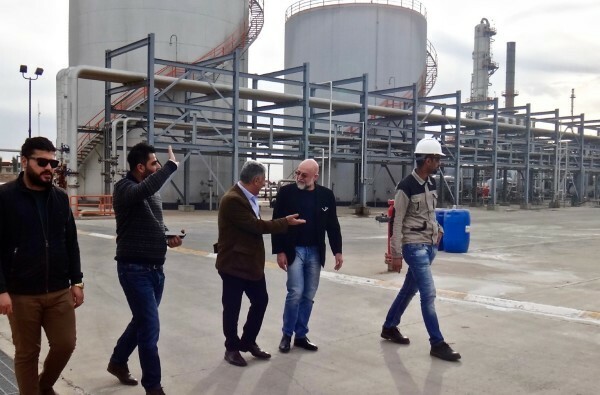 The first point of the tour, the Erbil Refinery, owned and operated by KAR group, is in Kawrkosek in the Khabat district, west of Erbil and next to the Upper Zab river, one of the tributaries that feeds the Tigris river. The tour of the facilities by the refinery crew was an experience for me to translate my theoretical knowledge of refineries into a real life feel for the process, an experience that I aim to repeat during my future trips. 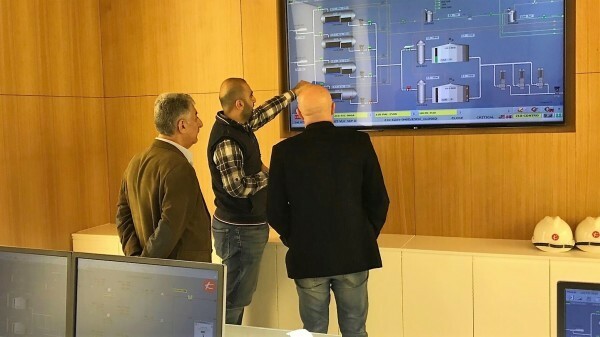 We went through the control rooms and the three production lines that refine crude oil to petroleum products such as Naphtha, Kerosene, Diesel, Fuel Oil, Gasoline, Jet Fuel and Liquid Gas. My friend explaining the operations at the Erbil Refinery, Erbil. After a couple of hours of lunch and a tour the next stage was the drive towards Khurmala oil fields, operated by the same group and the source of the crude that feeds the refinery through a 20" pipeline over the 40km that separates them. The Khurmala oil fields are within the Khurmala dome, one of the three domes or geological formations of the Kirkuk supergiant field. The other two domes are Avanah and Baba which are operated by Iraq’s North Oil Company. The Kirkuk super giant field has a deep meaning for most Iraqis, especially those of my generation as it was the first and main source of Iraq’s oil wealth prior to the discovery of the southern super giant fields. 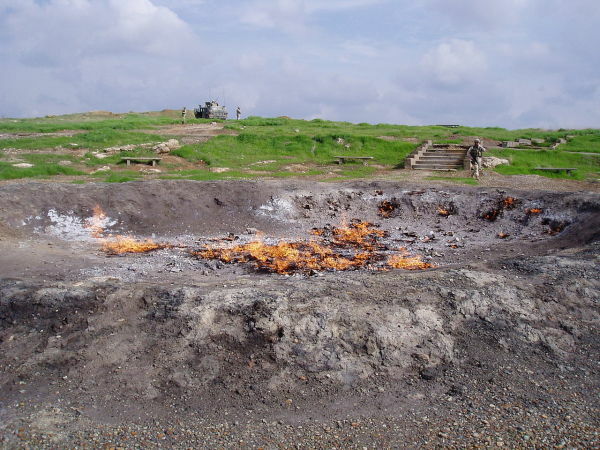 Iraq’s oil story started with the discovery of oil in 1927 at the Baba Gurgur field, in Kurdish “Father of Eternal Fire”, within the Baba Dome. Fires, known as “Eternal Fires”, have been burning in the middle of the field for over 4,000 years (see photo below) and are the source of many legends, fables and probably fire worship. Almost 90 years later the Kirkuk super giant field is still among Iraq’s most important fields holding an estimated 9 billion barrels of recoverable oil after pumping about 14 billion barrels since the 1920’s (IEA 2012). Its production declined from a peak of 1,000,000 bbl/d in the 1980’s to around 230,000 bbl/d by end of 2017, but there are plans to restore this production to about 700,000 bbl/d in the next few years. With these thoughts in mind and with the history of decades of conflict, including the ISIS conflict of the last three years, I was full of excitement and anticipation as we approached the field. I was not disappointed as my friend and the field’s crew provided me with all that I wanted to know and more about the details of the field, its operation and provided valuable lessons on oil fields. After a couple of hours, we headed to my friend’s home for dinner, but not before taking a good-bye photo with the new eternal fires of the Khurmala oil fields. The shortness of the tour did not allow for any time to see the natural beauty of Kurdistan, formed eons ago as the Arabian Plate collided with the Central Iranian and Anatolian plates which ultimately created Kurdistan’s breath-taking mountains, gorges and valleys. However, this is something that I intend to do in my upcoming trip later on this month which will coincide with the Nowruz holidays celebrating the new year in the days running up to the Spring Equinox. I will report on this in one of the upcoming newsletters.